The Governor’s proposal also includes a teacher recruitment program with loan forgiveness for those who teach in Florida for at least 5 years. Florida Governor Ron DeSantis says Florida’s teachers are moving in the right direction. Under his proposal announced Thursday at Armwood High School, about 45,000 teachers rated as “highly effective” would be eligible for bonuses of more than $9,000. He says those ratings will no longer be tied to scores on the SAT and ACT. 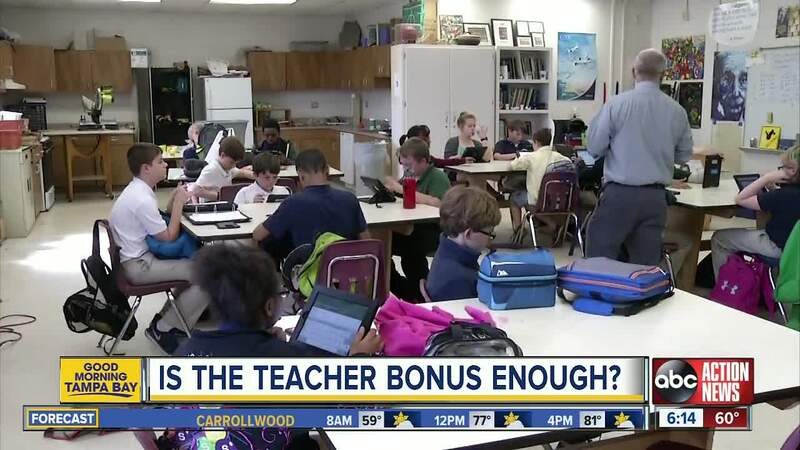 “If our bonuses program passes we’ll go from about 37th or 38th in teacher compensation to about middle of the pack, which is a big jump for just one year and obviously we want to do more,” he said. Mike Gandolfo, president of the Pinellas Classroom Teachers Association, says bonuses are nice but don’t solve the overall funding problem. And those bonuses won’t include many deserving staff members. “Not only the fact that it divides teachers, but what happened to our support professionals, that work in that classroom, that sometimes work one-on-one with students. Those people are making near poverty wages,” he said. Another part of the bonus proposal is to increase the percentage of African-American teachers that get them. Right now that number is only 1%. “There’s going to be a significant number of teachers in title one schools and principals who will be eligible for bonuses,” said Gov. Desantis. Union leaders say they want to see salary increases teachers can count on year after year, that make it a profession people can live on. “Just give us the national average. We don’t have to be tops. Give us the average. Because we are about four grand less than the average of all the states,” said Gandolfo.